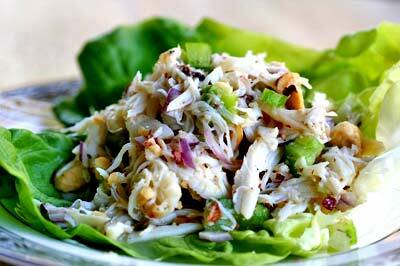 This delicious crab salad works well both as an appetizer and a side dish. It may require some time to make, but the process is easy. 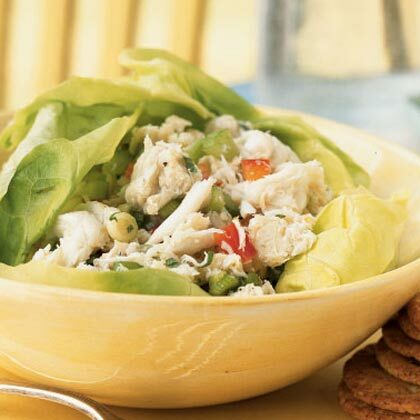 You don�t have to use real crab meat, imitation is just fine. Boil the eggs, cool them off in cold water. 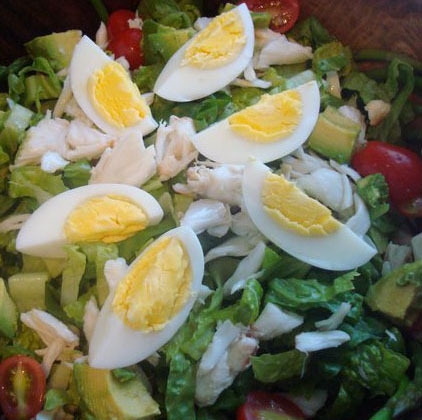 Finely chop eggs and crab meat, mix them together in a large bowl. Dice the onion, also as finely as you can. To get rid of sharp onion taste, pour some boiling water over the diced onion; the best way to do it is in a colander, in the kitchen sink, so that the hot water drains right away. Add the onion to the other ingredients, sprinkle some salt, and add mayonnaise. Mix well. Serve the salad cold, in a bowl or on crackers. Decorate with fresh parsley if you want to make it look fancy. Another thing you can do is stuff pita bread with it (works well for picnics). Store refrigerated.